The Dodge Coronet's roots go back to 1949, when it debuted as one of the company's first postwar models. By the time the late 1960s rolled around, the Coronet was bonafide muscle. For 1968, the car received updated exterior styling. Gone were the straight lines and sharp edges, replaced by a rounder, more "Coke bottle" look. 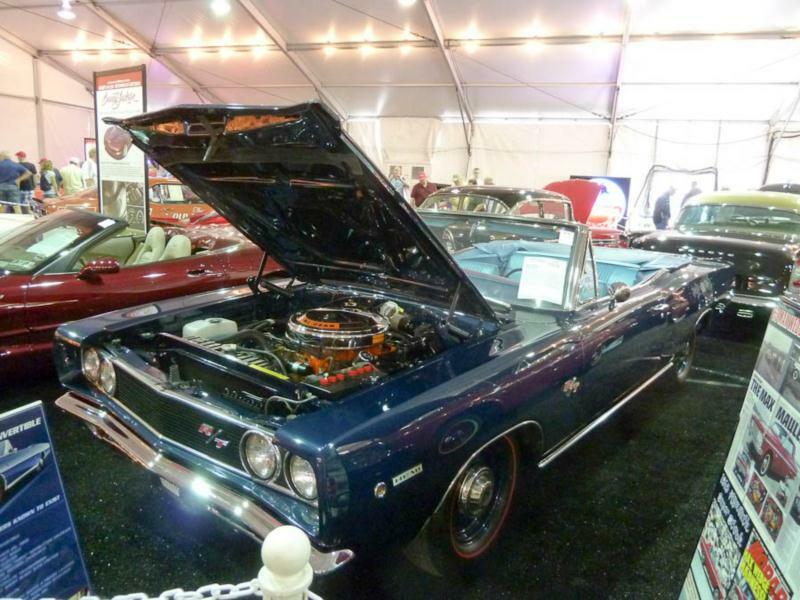 The Coronet was still offered in a range of body styles, including two- and four-door sedans, a four-door wagon, a two-door hardtop, and a convertible. Engines, too, ran the gamut from mild to wild, and the Coronet could be as staid or as heavy-duty as buyers pleased. At the bottom of the range was the Coronet Deluxe, which came powered either by a 225-c.i. slant-six or optional 180-hp 273-c.i. V-8. Next was the Coronet 440, which had six-cylinder power, though most were ordered with either the 273- or 440-c.i. V-8, which made 375 hp. Further up the range you found the Coronet 500, which benefitted from one of several V-8s, including the standard 318-c.i. unit, a 330-hp, 383-c.i. unit, or the 440. Beyond that was the R/T, with the 440 standard and the 426-c.i. Hemi V-8 with dual quad carburetors and 425 hp as an option. TorqueFlite three-speed automatic transmissions were standard. Mid-year, Dodge also introduced the Coronet Super Bee (easily recognized by dual stripes around the tail). It was a stripped-down Coronet, available only as a two-door hardtop coupe, with standard 383 power mated to a four-speed transmission. The 440 Magnum engine was optional. Standard equipment in the 1968 Coronets included floor mats, heater/defroster, and window trim, among other items. The Coronet 440 added a vinyl bench seat (in hardtops and wagons), as well as dual horns and carpeting. The 500 models also featured vinyl bucket seats in the hardtops and sedans, while the R/T featured a 150 mph speedometer, heavy-duty battery, suspension and brakes, and bodyside stripes. Super Bees were appointed with dual exhaust, heavy-duty suspension, and a power bulge hood. Dodge added a new engine mid-year 1969—the 440-c.i. V-8 with three two-barrel carbs. Known as the 440 Six Pack, the engine produced 390 hp and 490 ft-lb of torque and was available only on the Super Bee. The four-barrel 440-cid Magnum was standard on the R/T. Also new was a fresh-air induction system, which came standard on Hemi-powered cars. It featured twin air scoops. A new front end characterized the Coronet R/T for 1970, which featured a split grille. Faux, rear fender scoops became standard. All powertrains carried over, and while muscle was at its peak, the decline would come quickly, thanks to toughening emissions restrictions and the oil crisis. Just 14 Hemi Coronet R/Ts were built in 1970, and 36 Hemi Super Bees. After 1970, Dodge discontinued both the R/T and convertible, leaving only the four-door sedan and station wagon to carry the Coronet torch. Today the Coronet is best remembered in its tire-smoking R/T and Super Bee trim, and is one of the better expressions of pure American muscle Mopar put on the street. Click here to read Hemmings Motor News' Buyers Guide for the 1969 Dodge Coronet Super Bee.